Camping in the summer creates the best memories. I’m not sure if it is the fact that you are out communing with nature or that you can’t get cell reception that really pulls families together. 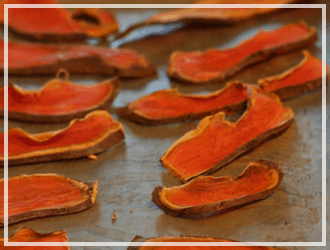 Whether you are camping at the beach, a campground or even in your own backyard, everyone could benefit from knowing a trick or two. 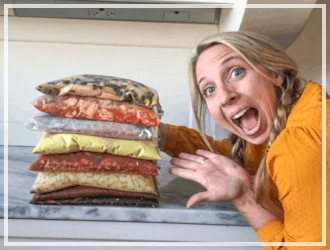 Here are 8 of my favorite camping hacks to use on your next camping experience! 1. 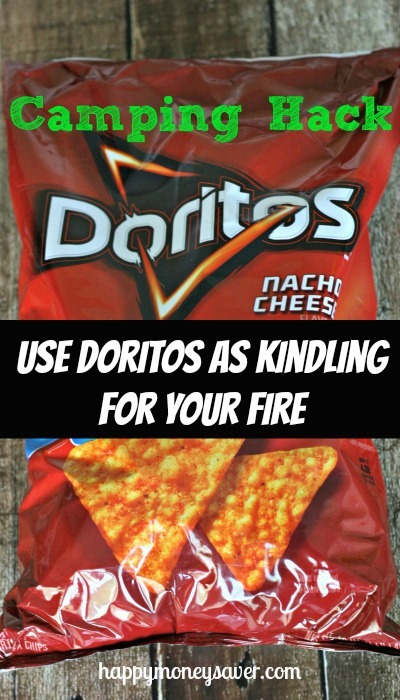 Use corn chips like Doritos or Fritos as substitute kindling when you are starting a fire. The greasy (yet delicious!) part of the chips helps the fire get going quickly. 2. Before you leave on your trip put important and sensitive items in separate plastic bags for safe keeping. 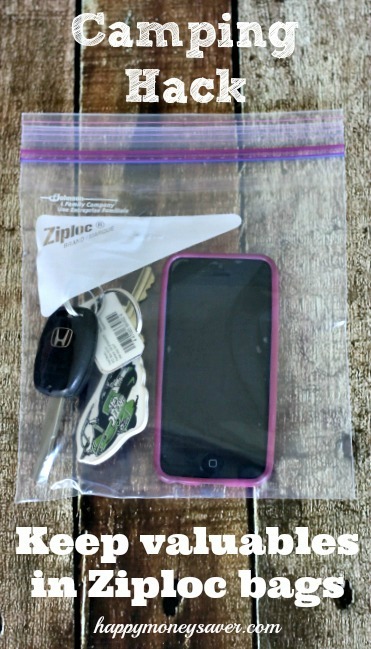 Even though your phone might not get service, if you bring it camping encase it in a plastic baggie for protection and make it easy to keep track of. 3. 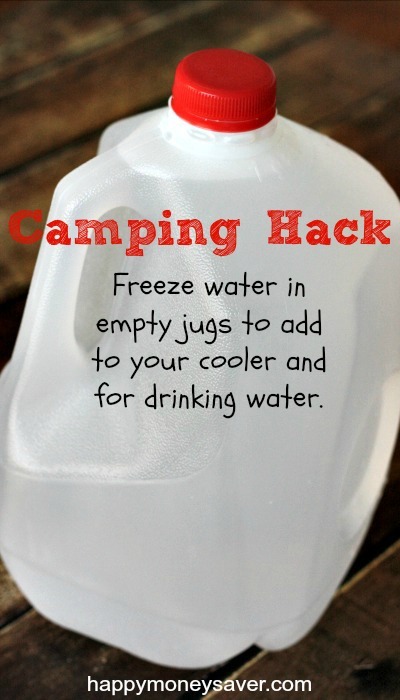 Fill clean, empty milk jugs with water and freeze it before leaving on your camp trip. 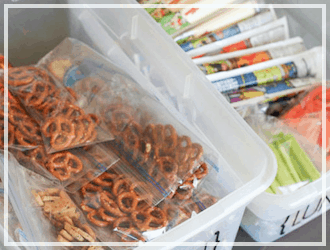 Add the jugs to your cooler to save money on ice and keep your food cold for longer. When it melts you can use that water as drinking water for your family. 4. 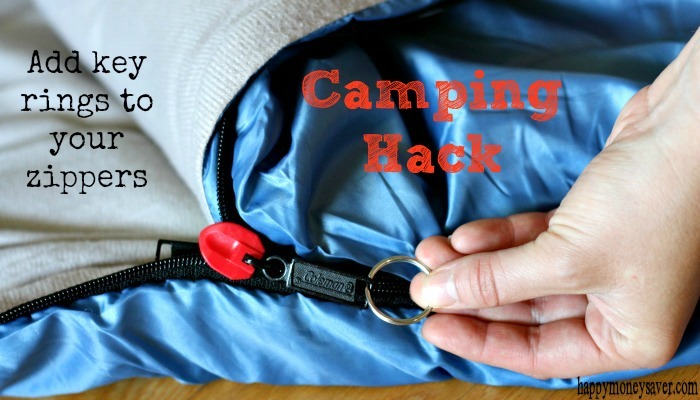 Make your zippers easy to handle by adding a key ring to them. This is especially useful for sleeping bags in the middle of the night! 5. 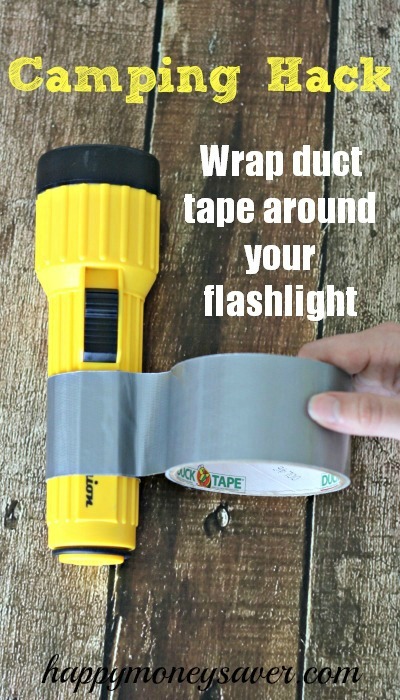 Wrap duct tape around your water bottle or a flashlight to save space and also have quick and easy access to it. Duct tape is great for blisters and also can be used to remove ticks. 6. 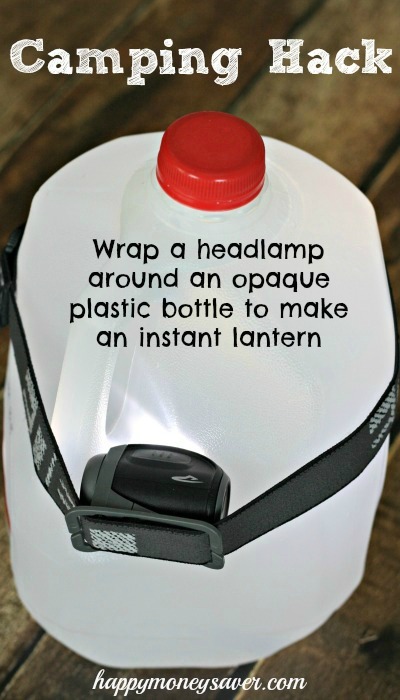 Wrap a headlamp around an opaque plastic bottle to make an instant lantern. It can light up your tent by hanging it in the middle of the tent or you can leave it outside to use it at night. 7. 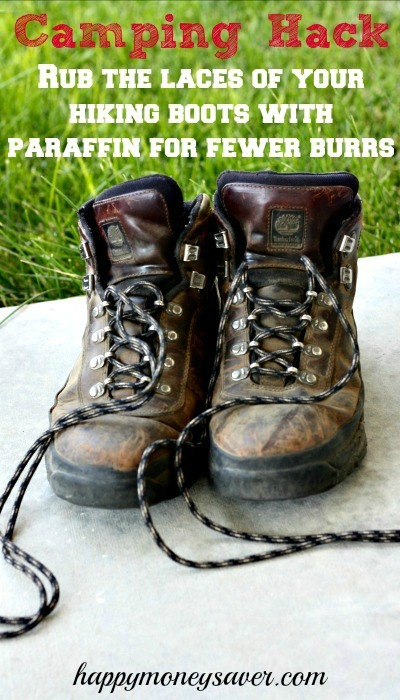 For fewer burrs when you are hiking, rub the laces of your hiking boots with paraffin before hitting the trail. It is nice to come back and be ready for your next adventure without worrying about cleaning up your shoes. 8. Yoga mats are not just for exercise anymore. They can double as foam sleeping pads to isolate you from the ground and give comfort when sleeping. 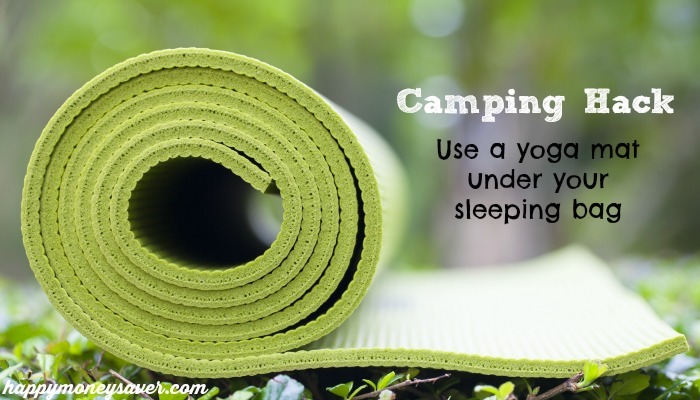 Yoga mats roll up nicely and are easy to throw in to your camping supplies. 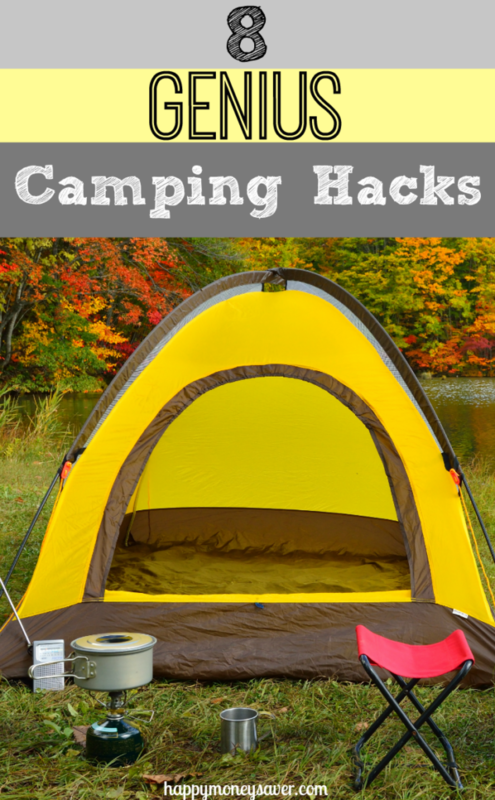 What are your family’s favorite camping hacks? Re: reusing milk jugs. Just don’t. 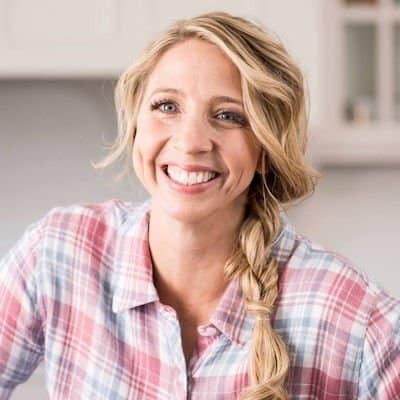 Theres’s no way to fully rid the plastic of milk solids, even with bleach or detergent or vinegar, and drinking melted ice water from an upcycle milk jug will introduce unpleasant bacteria to your gut. 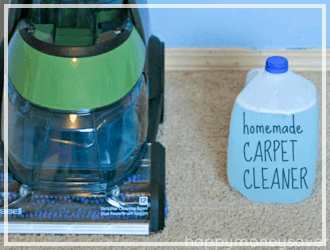 Instead, use one and/or two liter soda bottles–washed with warm water & detergent, rinsed well, then bleached with one tbsp unscented laundry bleach and two cups hot water, swish vigorously then rinse well… don’t forget to bleach the cap, too– filled with water… leave 1.5″ of air space at the top for expansion. Thanks for the tips. I used 1 gallon jugs my iced tea came in. These were great ideas. Thanks and happy camping. I put a magnifying glass in first aid kit. Extra fire starter; especially if backpack camping. Any convex glass will do–even reading glasses! I like taking those flat marbles from the dollar store to use as a back up fire starter. They’re small, super light weight, provide some magnification so I keep them next to the tweezers in the first aid box. Speaking from long camping experience, if you’re going to use plastic jugs (milk or otherwise), only fill them two-thirds to three-quarters full before putting them in the freezer. Also, bleach is caustic (it’s a base, not an acid), which can mix with the milk fats and saponify, leaving a nasty residue! If you rinse your empty milk jugs with cold water and a little vinegar as soon as the last glass of milk has been poured, then wash with hot, soapy water, you won’t have to worry about residue. (Former dairy farmer- this is how we washed the pipelines that carried the milk from the cow to the tank- acid rinse followed by wash cycle.) Another thought born of long experience: drinking the water as it melts in your jug makes the ice melt faster and also doesn’t keep the food as cold. “Space bags” are great for packing pillows, sleeping bags (folded, not rolled), blankets and bulky jackets when not in use and when transporting to/from camp! Make a chamber pot out of a 5 gal plastic bucket lined with a kitchen garbage bag and put some kitty litter in the bottom. They make toilet seats just for those buckets! OR…sit under an adult potty chair like you buy for invalids that fold up. If using a milk jug for water, make sure that you wash it out first with bleach water first and dish detergent if you want to get rid of the bleach taste. Trust me, you won’t like what happens if you only use dish detergent to wash out your milk jug. Better yet, just buy a gallon of water and freeze that and then re-use that jug for now on. A lot of people use bleach and dish detergent together, but it’s never a good idea. Bleach and Ammonia react with each other. Ammonia is the key cleaning agent in many dish soaps- Dawn is one of them. And it explicitly says on the bottle never to use it with bleach. (It can create a toxic gas.) I would actually suggest using dish soap and vinegar if you want to neutralize smells. 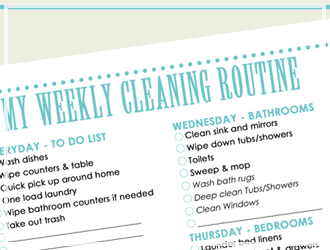 The vinegar and dish soap cancel out each others smells if used in equal proportions. and I have been giving them to my neighbors to store water in for an emergency. Like stated they don’t have to go thru all the cleaning hassles of a milk bottle. buying a gallon of water is the best @ 99 cents I find the plastic stronger and no after tastes or stuff floating in it later. A gallon of water is inexpensive. 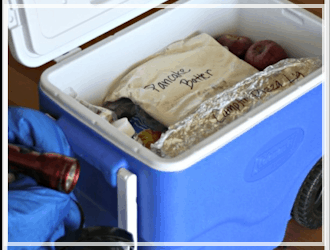 Once frozen, it makes an excellent ice block for your cooler that doesn’t leak. The bonus is you have pure drinking water as it defrosts. I prefer this to washing out a milk container. to save space just take a pillow case, not a pillow When you get ready for bed, put in your dirty cloths, now you have a pillow and all your dirty cloths in the same bag. Maybe on the first night pout in clean cloths, sweaters are the best for a pillow. When my kids were still young and we still twnt camped, instead of dirty clothes we put our coats in the pillow case. Then when you have to trek to the potty you know where it is in the middle of the night! Good idea–I hate those midnight potty trips when you are freezing! You can always potty behind a tree? For middle of the night “potty” trips – bring or save some empty water plastic bottles with screw top to pee in … empty coffee cans with plastic lid for the other… over time, both will break down so you can throw them in the garbage. add a dryer sheet when you put those dirty clothes in that pillowcase. 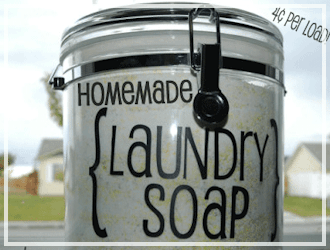 Helps mask the smells of the campfire and hiking trips from the day! I don’t think I want to sniff my sweaty camping clothes all night while i sleep. Eew. Not trying to be mean…..just my preference. None of these “hacks” are original. They’ve all been around for some time. There is never any need to be a nasty person. A lot of good ideas in one place. Thanks for sharing. They may not be original but they are NEW to many of us. Sorry about the negativity of some. Thanks Tracy. I knew some of them but the parafin on the boot laces is new to me. I too am looking for some fresh ideas. So I can understand stargazers thoughts. I don’t think stargazer was being nasty…just stating a fact. Seems like there are a lot of repost on Pinterest all with different captions to get you to go to there website. Saying that I did learn something new within the comments. It’s not that serious. I think your a little paranoid. Stargazer is a word that’s leaves very little to wonder about the true meaning of the word. To describe Stargazer as nasty was distasteful. I’m 58 years old and go camping all the time and there was a couple of them that I had never heard of so why don’t you keep your rude comments to yourself. There are still people out there that have not heard of everything! I agree with you Billie…58 and never heard of some of these hacks..Would love more, love to camp. so? People are born every day as well…how do you think the “newbies” in the field learn? Everything you ever learned in school was there generations before you for the most part….does that mean you should have been taught from a system that was “scrapped” and started all over the day you enrolled since none of the information was “new”? Rude person. I enjoyed it. Yes,some off these have been around for along time. Im sure you’ve been around too awhile. But there are millions of young kids that don’t know about these fun hakes. That camp or play in the woods. So to know these fun, and maybe could safe your life Hakes. Its agreat thing there are friendly people that take there time to share Hakes that make camping easier,and maybe even help to servive. So has water but we still drink it! Hi karrie! thank you for the tips on camping, i know this is off topic but my chickens were eating a sick wild bird! they ate its eye and were plucking its features do you or any commenters (it would be so great:) have any clue on what i can do ? thank you for everything!